The perfect vacation looks different for everyone. 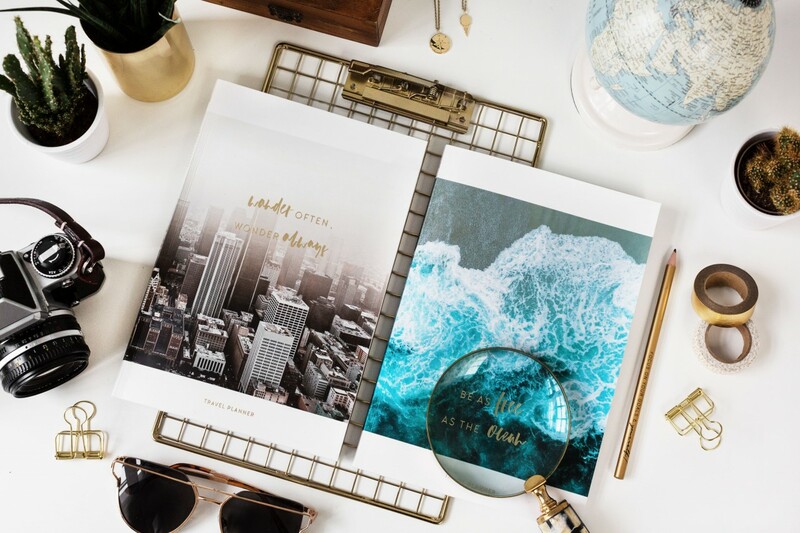 If you prefer relaxing on the beach or strolling through the streets of the city, the travel planners for your dream vacation will help you with the preparations and will be by your side every step of the way. But before you can start exploring, there is still a bit to do! One very important one is writing your very own bucket list for the trip that contains all the experiences, adventures and activities you want to tick off on your journey. Click here for the free download of your City & Beach Bucket List! Just looking at the gorgeous Beach Travel Planner and its summery design makes us jump up and down of excitement for the journey! Prior to the trip, note your personal goals, expectations and wishes and create your very own moodboard. Look at it whenever you need a little more motivation to properly plan your trip to the ocean and dream of all the sunny hours at the beach. Make your dreams of the perfect city trip come true and experience all the spots you’ve always wanted to see! Write down your destination, the distance from home and the duration of your trip in your City Travel Planner to get started. The city might get a bit hectic and overwhelming but on this page, you’ll always have the most important phone numbers and details at hand. … and I’m not missing a thing this time! With this packing list and its different categories, it’ll be very hard to forget anything at home. Once you’ve put an item into your bag, tick it off the list and do the same for the journey back to make sure nothing is left behind. How about a penthouse, a whirlpool or a super cozy flat in the art district of your favorite city? Collect all accommodation offers in your planner and finally decide which one ticks all your boxes! It doesn’t matter if you’re flying short distance or to the other side of the world, you’ll have all your flight details at one glance in your travel planner. Note the boarding times and gates on a double page and to always be on time. The flight is booked and transfers have been scheduled. Make sure everything is going smoothly on the day of departure by writing down a precise timetable of your journey out. It’s nice to chill on the beach but it can also get a bit boring after days and days of relaxation. Something exciting needs to happen at some point! Search for activities that’ll make your journey unforgettable and unique. How about snorkeling, a safari or going on a quad tour? Once your data and battery is gone, you’ll be more than happy to have the city map neatly printed out and glued into your travel planner. Mark your favorite spots and your accommodation and find your way back wherever you are in the city. No one is expecting that you speak the language of your destination country fluently but a few words can already make your trip a lot easier. A “thanks” or “you’re welcome” in the local language might open a couple of doors for an even better trip. By now, you’ve probably found out where the hippest cafés are and where you can find the most gorgeous clothes. But do you also know some basic facts of your holiday destination? Note all the important facts in your planner and shine with knowledge! Even the most perfect journey has to end eventually and it’s back to packing your bags and making the trip to the airport. Make sure your transfers to and from the airport are well planned to avoid stress and write down all the information in your travel planner. After you’ve made the city yours and have filled a whole suitcase with new experiences, it’s sadly time to go back again. To make the journey out as smooth as possible, note the flight details in your planner and enjoy the way back home. City or beach – as long as your journey is planned like you want it, it’s going to be an awesome trip!